Husk or Bust! 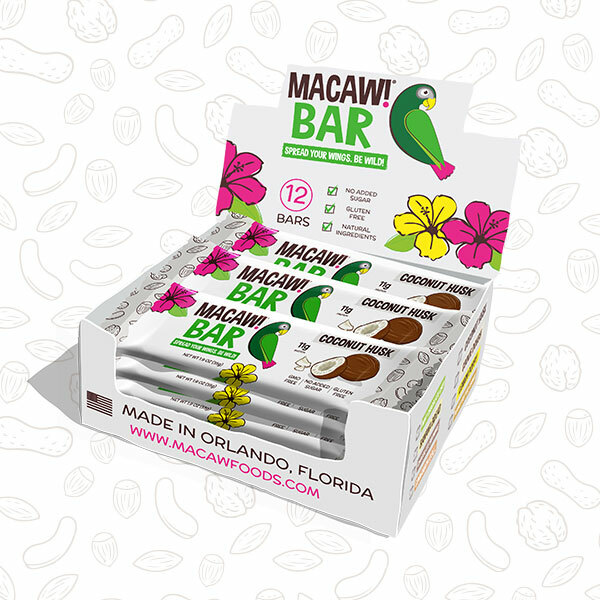 Our Coconut Husk bar helped put Raaw Macaw! on the map. And for good reason. Each bite is exploding with organic dark chocolate, coconut, and creamy almond butter. Yumm! 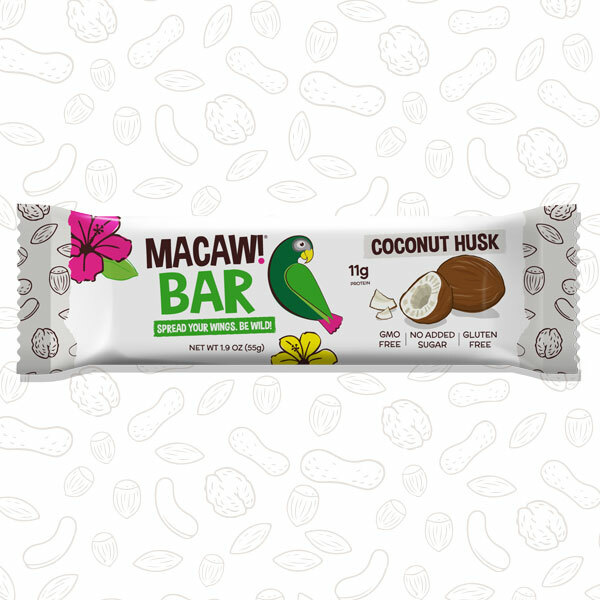 Whether you’re a traditional coconut connoisseur, or just appreciate anything that’s plain ol' delicious, you won’t be disappointed with this classic Macaw! concoction. If you’re not familiar with our background, the current line of Macaw! Bar flavors were not founded on any sort of predetermined recipes. They are the result of many painstaking hours in the kitchen, meticulously experimenting with countless ingredient combinations. Those combinations would then be sampled and sold at the local Farmer’s Markets. Each weekend was something different, and customer feedback was used to further refine and develop. After the first several weeks of this back and forth pattern, it occurred to me that I had accidentally committed a severe act of injustice to one of my life long, top favorite things in the world. Coconut. It was a tragic case of gross negligence, and the remedy for personal salvation was achieved in the form of, Coconut Husk! Feedback at the Farmer’s Market indicated that I had done something right, and since then, Coconut Husk has remained one of our top sellers. Originally topped with a coating of shredded coconut, a controversial decision was made in early 2017 to transfer that topping to the inside of the bar. Resulting in the same amount of coconut, but less mess. Regardless of where you stand on this historical debate, we hope you can put politics aside, and just enjoy a good Coconut Husk. Husk or Bust! It's taken a few years, but we've managed to get the 'base' of our bars just right. By using specific ratios of each ingredient we've achieved the perfect balance of nutritional density, texture, and most importantly, incredible taste! 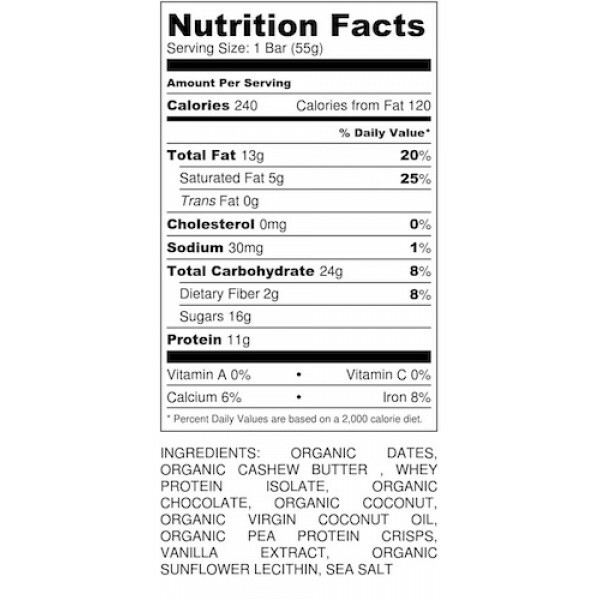 The key to the explosive coconut flavor in the Coconut Husk bar isn't the use of artificial 'coconut flavor' oils like some of our competitors. Instead, we use as much organic shredded coconut and virgin coconut oil as we possibly can. Not only are these ingredients beneficial to your health, they help contribute to this bars great texture. Organic pea protein crisps add a nice crunchy texture to each bite, while increasing the overall protein content of the bar.